In this episode we take a look at the king of the West Franks, Charles the Simple. Charles the Simple looking very regal. Charles the Simple presenting his daughter, Gisla, to Rollo.. . . In this episode we continue to examine the life of Rollo as he travels across the north sea and finally reaches the shores of Normandy. An artistic interpretation of the 885 siege of Paris A map of Paris during the 9th century The Emperor Charles the Fat. . . In this episode we take a look at Normandy before the arrival of the northmen and introduce some key figures of the Normans including Rollo. The 885 siege on Paris Haesting takes Luna A Statue of Rollo. . . In this episode we begin a new series call A Norman Foundation. In this episode we explore the Norman myth and the creator of the main text, Dudo of St Quentin.. . .
We finally conclude the Origins of the Rus series with a final episode that includes some final thoughts, a Q&A and a new tradition.. . .
Vladimir returns to Kiev and converts the Rus to his new religion. Vladimir watches as the people of Kiev are baptized. Pechenegs raid Rus merchants. Rus Soldiers during the later 10th century. A map of the Kieven Rus territory. The solid red line was the borders of Vladimir's realm in 1015 when he died.. . .
Vladimir tries his hand at ruling the Rus and decides that his people need a new religion.. . . This is part 2 of the 2017 Halloween special on Witchcraft and magic in the Middle Ages. This episode is a brief history of witchcraft and magic from a little before the beginning of the middle ages to the closing of the 15th century. Witches giving an offering to a demon. Witches worshiping a demonic goat. Hans Baldung Griens woodcut of witches preparing for the Sabbath The Knights Templars being burned at the stake.. . . This is part one of a two part Halloween special on Witchcraft, sorcery and magic in the middle ages. In this episode we take a look at the story of how Pope John XXII was the target of a group of assassins who tried using magic as their murder weapon. Pope John XXII. Pope John XXII and his papal court. A map of southern France. The papal palace at the city of Avignon.. . . In this episode we take a look at the Rus state after the death of Svyatoslav. The warrior prince left three sons to inherit his lands and affairs quickly devolved into civil war.. . . 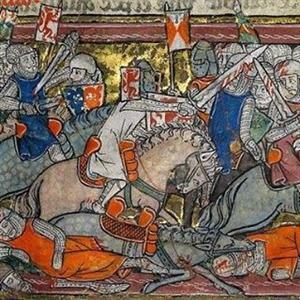 In this episode we take a look at the many military campaigns of Prince Svyatoslav. Svyatoslav and the Rus invade Bulgaria. Svyatoslav and the Byzantine Emperor John meet in person. Svyatoslav killed by the Pechenegs on the Dnieper.. . . In this episode we look at the second half of Olga's regency as she converts to the Eastern Orthodox Christianity. An artists interpretation of Olga being baptized Olga meeting with Constantine VII. . . In this episode we take a look at the successor to the Rus throne after the murder of Igor. A more modern depiction of Olga. Olga watching while the Derevlian nobles were burned in a bath house. Olga when she first comes upon Igor's body.. . . In this episode we take a look at the second half of Igor's reign as he tries to hold together the Rus after the loss to the Byzantines.. . . In this episode we will take a look at the first part of Igor's reign as he sets out to take the Rus to new heights. A depiction of Igor. Greek fire being shot from one boat to another.. . . In this episode we take a look at the reign of Oleg after the death of Rurik and see lands of the Rus grow.. . . In this episode we explore the how Rurik might have been buried through the accounts of the Arab diplomat and adventurer Ibn Fadlan.. . . In this episode we talk about the raid of 860 on the city of Constantinople by the Rus Vikings. Rus at the city walls. Photius dipping the vestments in the sea. And here is the Skillandbonesradio podcast by Brad, Kevin and Loren. http://skillandbonesradio.blogspot.com/. . . In this episode we take a look at the founding of the Rus kingdom by Rurik, talk about his reign and where the Rus kingdom may have been. A Statue of Rurik And a basic map of the general area of the early Rus. . . In this episode I talk about the Russian Primary Chronicle, archaeology, and the beginning of the Viking age. Some of the major trade routes for the Vikings. The beautiful Oseberg ship in Oslo.. . . In episode 3 I talk about the end of the middle ages and a number of dates that historians have used to describe the transition from medieval period to the early modern age. This episode acts as a bookend for the podcast as I wont go past my chosen date for the middle ages.. . . In episode 2 I talk about the end of the western roman empire and the very beginning of the middle ages. This episode will act as a beginning point to help frame the rest of the podcast.. . . This episode is a introduction for myself and how the podcast will be structured for future episodes. If you are not interested in an introduction and want to skip right into some history start with episode 2.. . .